I think you've been looking at it too long...your colors are great. I wouldn't change a thing there. What I would work on some more though is the message you are trying to communicate. Right now, you are leaving it up to the viewer to find a story, and that's a very powerful tool for storytelling...suggestion....but It feels uncontrolled here. As if you didn't plan on doing that. I'd say..leave this image as is...working too long on your images will kill them rather than make them better in a lot of ways. When you have 30 like that, then you can go back and look at them, and compare. You'll see then where your weaknesses are, and your strengths as well! Well, wouldn't you know it, he was right. It's been almost 5 months and I realized what my weaknesses were. The story was not clear, the colors were off (even though Pascal said they were fine) and the characters were not strong enough in the scene. They were, in fact, fighting with the scenery. I've done quite a few illos since the original attempt at Lucy, and that helped me the most. I was now able to make the necessary improvements to finally finish this illustration and feel satisfied. I have to thank Michaele Razi, for giving me some final things to consider that made the difference. As an artist (and as a human being) we can't be tied down to being great right away. Sometimes we need to be mediocre in order for us to grow and become better. Every little thing we create or do is a step closer to who we want to be. It doesn't matter how many years of experience we have under our belt, we must never stop learning... about ourselves and from others. I hope you enjoy the little story of Lucy and her friend Argyle. A million times better. Not that the last one was bad, but I see what you mean. Time really helped you see your original vision. Awesome stuff man. This was an AWESOME post Man! Really what really great nuggets fare found here. This is so awesome. Thanks for sharing this bit of wit and wisdom. Great work. Thanks so much again for sharing it. As a former boss of mine always used to say, "let's go for the 70% solution." What he meant is that don't wait to act until it's 100% perfect. That will never happen, anyway. @david Sometimes time is the teacher. @vanessa Thanks so much for checking it out, Vanessa! @Jeannette Those are words of wisdom. Thanks for sharing. I'll have to remember that. That image makes me smile. It really is MUCH better now! Way cool. Dennis, I always learn so much from your blog and this post does not let down. The lessons are so perfectly timed for what I am feeling at the moment. I love the whole notion of being willing to work through the mediocrity. Many of my 'non-creative' friends don't understand why I don't have a portfolio up yet and they don't get when I say, 'I don't have a piece worthy of the portfolio yet.' It is great that you have peers willing to force that critical eye. Thanks again for being out there and just a great virtual mentor. Dennis, I'm the type of person who expects my first attempt at anything to be nothing short of perfect. Intellecutally, I know that isn't realistic but my emotions take over until I get little reminders. Thank you for this poignant little reminder that any endeavor takes patience, passion, and perseverance. Your illustration is beautiful and "speaks" to me. When I paint I have a tendency to overwork things, as well. I think it's the nature of our inner critics. I love your final result! @heather Thanks, Heather. I appreciate that. Especially that it made you smile. @keyuri You explained it better than I did! Thank you, Keyuri. @Tricia Good to hear from you again. Don't get me started on the inner critic. I loathe that guy. Thanks! I'd love to see your work sometime. It's perfection, Dennis! 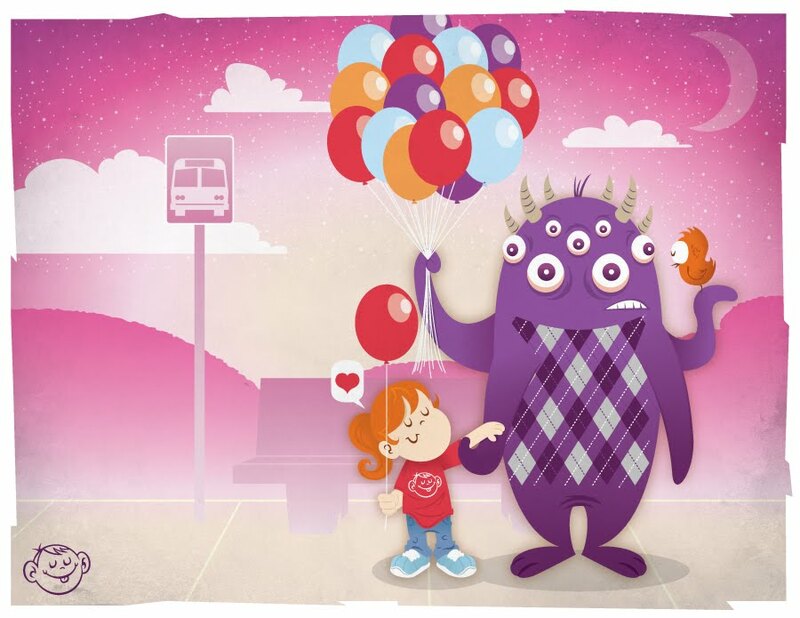 The bus stop is just what your illo needed. Instead of a vague narrative, it's a story. Definitely one of those pieces that I'll look at when I'm feeling either uninspired or grumpy--it has that recharging ability! Such a nice job! I'm assuming you used Illustrator? I amazed at the difference. The new illustration does make a storyline. I like the idea of creating and creating...then going back to see what could be better. Creativity is not a think process and I have a tendency to over think and not just create. Wonderful article Dennis! When you said "Sometimes we need to be mediocre in order for us to grow and become better", that really resonated with me. Thanks for sharing more of your illustrations with us. They always bring a smile to my face. really cool that pascal responded in such a constructive way. it is cool that you really learned something from it too. wow impressive illustration you done here. You made it so cute and adorable I wouldn't mind having an imaginary friend that's all purple hehe. @Sheila I think I know what you mean. But the truth is most things need to be thought about before you get started. It's rare when you just create something. It'll always need to be developed. Thank you, Sheila! @Sherryl I'm glad that resonated with you. Thank you very much. @Sarah Haha, wouldn't we all. Thanks! "Every little thing we create or do is a step closer to who we want to be." Thank you, Melanie. You're the best! Here is the link with the vector illustration video showing the amount of work that goes into creating one of these. Dennis, I love your title! Very appropriate. Thanks also for pointing out that we are allowed to make mistakes - I have certainly made my share and am sure I will make plenty more. Tying your passion/profession into real life examples - to me - is awesome. I really enjoy reading your posts!